The Golden Tips Tea Lounge belongs to the Golden Tips Tea Company. They are tea merchants and collect tea from plantations all over India including the Gardens in Darjeeling. The company is run by Madhav Sarda, who has branched out from the original Nathmull's family business and created his own. Golden Tips Tea Lounge is located right at the Chowrasta Mall and on the same line as Nathmull's Tea and on its left. Here you can have fresh Darjeeling tea and accompany that with some vegetarian snacks. As you walk into the store through the Mall benches, there is an impressive spacious lounge area inside. There are cushioned chairs and tables laid out. 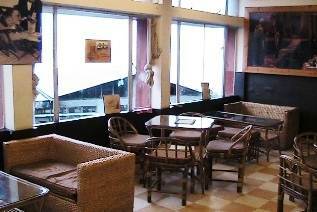 At one end and next to the large windows, there are sofas and tables that are ideal for relaxing and having a cup of tea. You can get excellent views of the mountain range from the window-side sofas. At the end, there is a large end-to-end wall painting that adds to the grandeur of the lounge. You get a wide range of fresh Darjeeling tea that you can order by cup or pot. There are regular black tea, green tea as well as ice tea. You can also buy Darjeeling tea from the counter that come in packets of various sizes. The Golden Tips Tea Lounge serves several vegetarian snack items as well. The day's specials are displayed in a glass show case which you can see right in front as you walk in. So you can actually choose your dish before you take up your seat. The items include veg. pizzas, burgers, pakoda, sandwiches etc. There is a section for souvenirs and gift items. It has ladies bags, brass items like small models of elephants, different types of curios, jewelry boxes, ceramic items like cups and plates, wood crafted items etc. 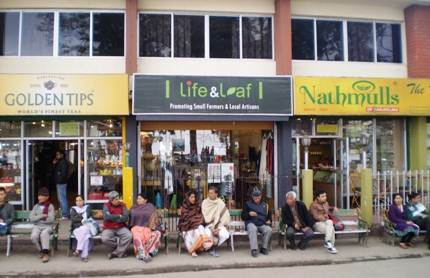 Golden Tips is located at the Chowrasta Mall and on the same line as Nathmulls, just adjacent to Amigos Tours & Treks.